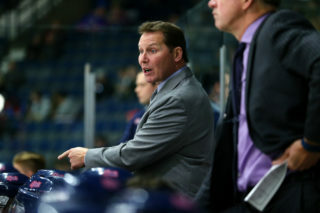 The Regina Pats (7-12-0-0) kick off a six-game road trip on Tuesday night in Cranbrook, B.C. against the Kootenay ICE (6-12-2-1). Puck drop is at 8 p.m. Regina time at Western Financial Place. The Pats picked up a third straight win in their last contest on Saturday night, 2-0 over the Swift Current Broncos. The ICE were last in action on Sunday when they dropped a fifth straight game, 7-3 in Calgary to the Hitmen. 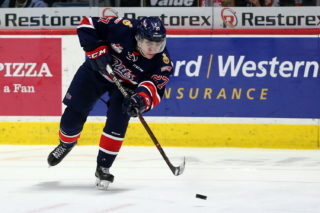 Tonight is the second of four meetings between the Pats and ICE, Regina is 1-0-0-0 in the season series. Tonight’s game can be heard with Bennett Dunlop Ford Pats Hockey starting at 7:35 p.m. on 620 CKRM. Max Paddock made 20 saves for his first shutout in the WHL and the Pats outlasted the Swift Current Broncos 2-0 on Saturday night at the Brandt Centre. 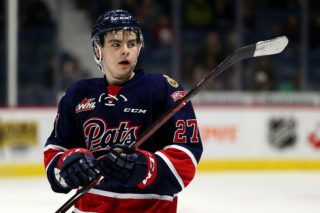 The Pats got the game’s first goal with 38 seconds left in the first, when Austin Pratt set up Jake Leschyshyn on the back door and he tapped in his team leading 13th of the season and the Pats led 1-0 after one. In the second, the Pats got the lead to 2-0, when Scott Mahovlich tipped home a Brady Pouteau point shot for his third of the season and the Pats took that lead to the break. Max Paddock shut the door in the third making 11 saves to complete his first career WHL shutout and the Pats won a third straight game, 2-0 the final. The Pats outshot the Broncos 24-20, the powerplay was oh for three and the penalty kill one for one. Regina finished their five-game home stand with a 4-1-0-0 record. The Pats are 1-0-0-0 against the ICE so far in 2018-19, winning 3-2 in Cranbrook on October 12. Robbie Holmes, Sergei Alkhimov and Austin Pratt scored in the win, while Max Paddock made 29 saves. The ICE got goals from Cameron Hausinger and Jaeger White in the defeat and Duncan McGovern made 24 saves. The Pats were oh for two on the powerplay and four for five on the penalty kill. The Pats have won five straight games on the road against the ICE, their last loss coming in January of the 2015-16 season. Max Paddock was named the WHL Eli Wilson Goaltending Goaltender of the Week on Monday. Paddock posted a 2-0-0-0 record, 0.50 goals-against-average, and stopped 59 of 60 shots for a 0.983 save percentage, while also recording the first shutout of his WHL career. 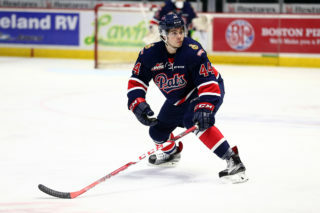 Friday, Paddock stopped 39 of 40 shots sent his way as the Pats defeated the Tri-City Americans by a 5-1 score. A night later, Paddock earned the first shutout of his WHL career, stopping all 20 shots on goal in a 2-0 win against the Swift Current Broncos at the Brandt Centre. The Pats will have a couple of new faces in their lineup tonight when they take on the ICE. The club has added 19-year-old forward Sebastian Streu to their roster for the remainder of the season and recalled 16-year-old defenceman Makai Mitchell from the Rocky Mountain Roughriders 16U for a portion of the club’s road trip. 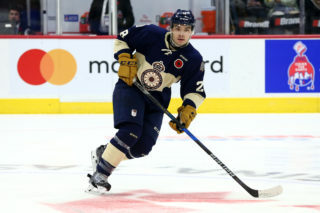 Streu played the 2017-18 season with Kootenay, scoring nine goals and three assists in 54 games. Mitchell, from Fort Collins, Colorado was listed and signed during the Pats training camp in August, he has a goal and an assist in 11 games this season with the Roughriders.